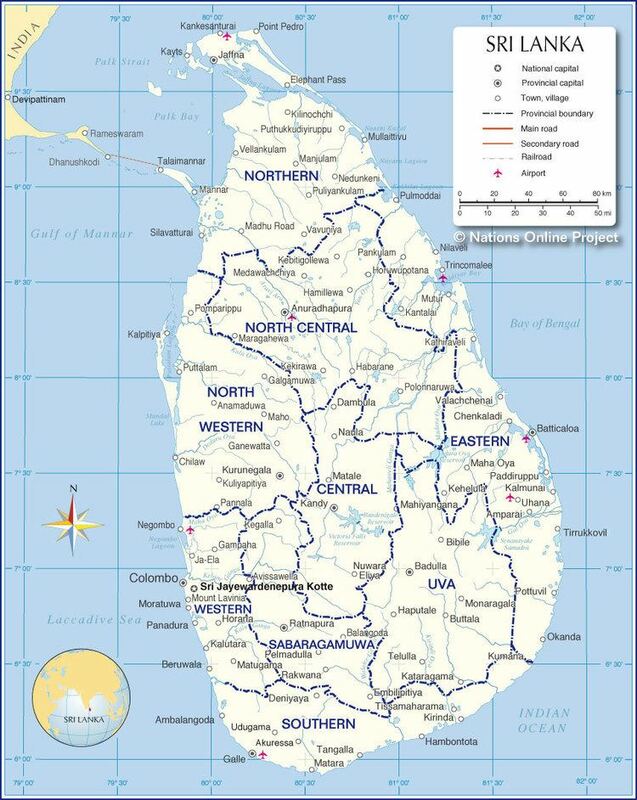 North Western Province (Sinhalese: වයඹ පළාත Wayamba Palata, Tamil: வட மேல் மாகாணம் Vada Mael Maakaanam) is a province of Sri Lanka. The districts of Kurunegala and Puttalam formulate Wayamba. Its capital is Kurunegala, which has a population of 28,571. The province is known mainly for its numerous coconut plantations. Other main towns in this province are Chilaw (24,712) and Puttalam (45,661), which are both small fishing towns. 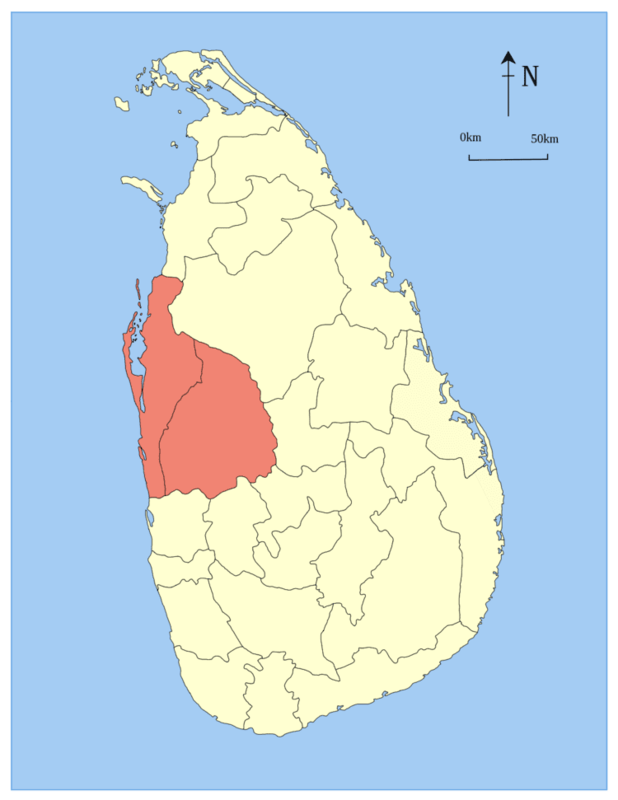 The majority of the population of Wayamba province is of Sinhalese ethnicity. There is also a substantial Sri Lankan Moor minority around Puttalam and Sri Lankan Tamils in Udappu and Munneswaram. Fishing, prawn farming and rubber tree plantations are other prominent industries of the region. The province has an area of 7,888 km², and a population of 2,370,075 (2011 census). The climate of Wayamba is tropical, with a marked dry season, and temperatures averaging between 20 °C in January to 25 °C in March.The south of the province is wetter,with almost 2000 mm of rainfall per year, but the north of the province is one of the driest regions in Sri Lanka,averaging under1100 mm of rain in parts. Paddy is the main agricultural crop in the province. Wayamba is the third largest paddy producing area in Sri Lanka. There are two main cultivation seasons. The Maha Season (October–January) or the period with excessive rainfall and the Yala Season (April–August) the drier season. In Yala season, the farmers have to depend on irrigation. More recent times, the paddy farmers during the dry season have opted to cultivate export crops and subsidiary food crops that bring bigger profits. Coconut – The largest industry in the Wayamba Province. The extent of land under coconut is 48% of the island’s area. Fisheries Industry/ Prawn Farming - The western coast of the North Western region is endowed with rich fisheries and other aquatic resources. The major varieties found in abundance are tuna, prawns, lobsters and cuttlefish. The country’s export-oriented commercial prawn farming industry is concentrated in the coastal areas of the Puttalam district. The Wayamba province is well served by all major commercial banking and financial institutions of Sri Lanka. These include, Bank of Ceylon, Commercial Bank of Sri Lanka, Sampath Bank, National Savings Bank, Hatton National Bank, People’s Bank, Seylan Bank and the Union Bank. All of these banks have an extensive coverage of their branches in the province. Three other development banks of Sri Lanka, namely The DFCC Bank, National Development Bank, Wayamba Development Bank,Ideal motors & Ideal finance also provide services to the province. The well preserved Dutch Fort in Kalpitiya (Puttalam district) dating back to 1670 is an evidence of the Wayamba’s European colonial period. The fort is complete with barracks, store houses and living quarters, Dutch colonial pillars and ancient tombstones. Kurunegala has many 19th century relics of the British colonial period including the government Agent’s residence and the Rajapihilla rest house. All three shrines are easily accessible from Kurunegala, - Munneswaram approximately 70 km, Udappuwa 95 km and St. Anne’s about 110 km respectively.